Yield losses can significantly drain company profits. Every unit of material, energy, or labor that goes into production contributes to the profitability of a high-grade, saleable product. In order to make improvements in yield, there must be visibility into the process from raw materials to finished goods to support repeatable, efficient operations and substantial financial and sustainability benefits. Production Management - Organizes the execution of production while providing the data context necessary to target areas of yield and loss in operations. Material Management - Provides a better understanding of lot-based genealogy and production routing information that contributes to material or labor issues. Quality Management - Aids the production process in running efficiently to maximize yield. Performance Management - Measures equipment performance to aid in maximizing plant assets and minimizing rejects caused by malfunctions. 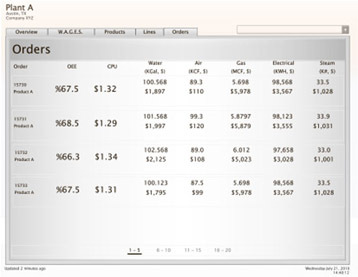 In order to address yield and loss measures, manufacturing needs real-time production operations information to indicate where the process may not be operating at peak efficiency. The CPG Suite of Applications provides the basis for continuous improvement. Investigate further by selecting the links below.